Spelling and grammar mistakes can be easy to miss but will instantly change a reader’s opinion on the credibility of a blog. 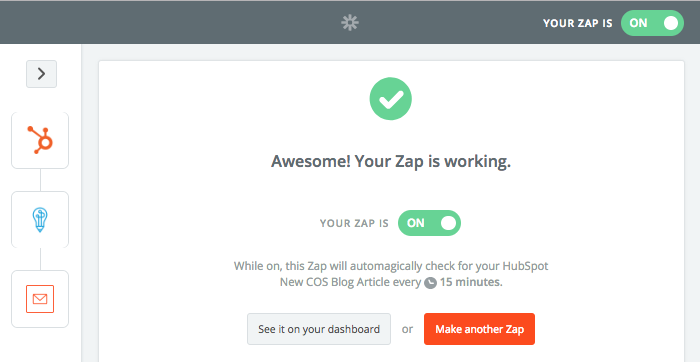 But, Zapier now has a Perfect Tense automation that will proofread your Hubspot blog drafts to help you catch errors you may have missed. 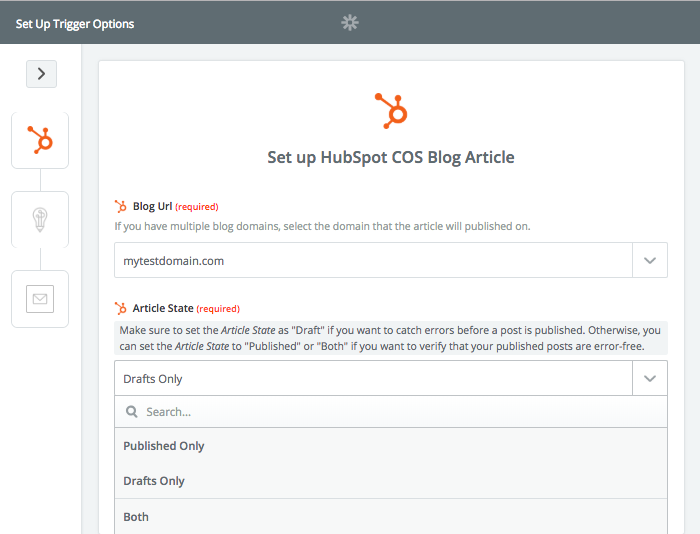 This Zapier integration will send you an email about HubSpot COS blog drafts that have spelling or grammar errors to help you eliminate mistakes before you publish. 2. Click the prebuilt template below to get started and follow along with this tutorial if you have any questions. Click “Use this Zap” above to read about how the integration will work and what apps are involved. Once you're ready, click “Create this Zap” to get started. First, you will see the trigger “New COS Blog Article” pre-selected for you. All you need to do is click continue. 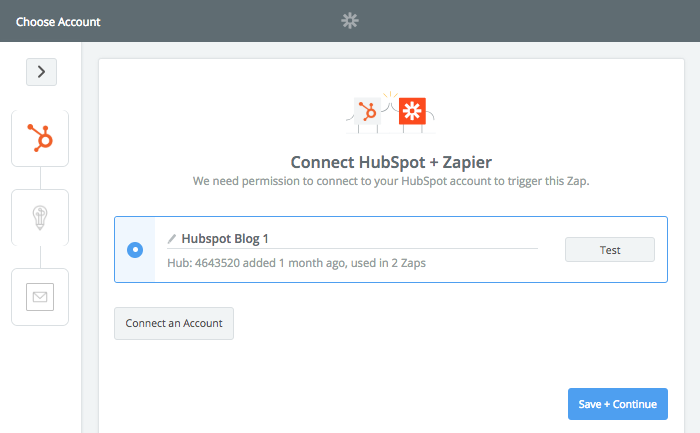 Now, you need to connect your HubSpot COS account to Zapier. Next, you will need to choose the domain of the blog you would like checked as well as the "State" of the articles that you would like Perfect Tense to proofread. We recommend selecting either “Drafts only” to make sure you are notified about errors in your content before it is published. However, you can choose “Published only”, or “Both” if you would like Perfect Tense to check all posts. 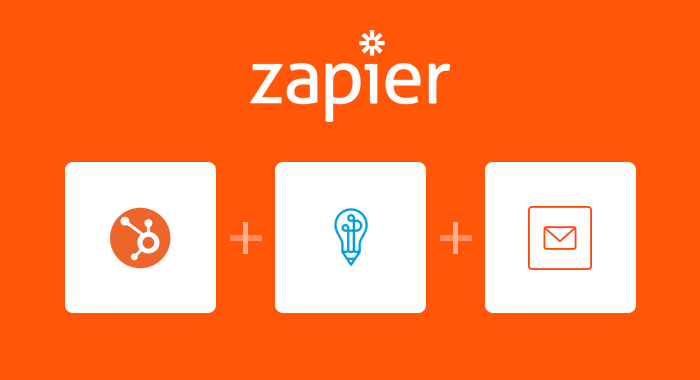 Zapier will pull in a sample from the domain you chose so that it can test the integration. Because you are using a template, the Perfect Tense action (Save File for Editing) will be already be selected for you. All you need to do is make sure your Perfect Tense account is connected to Zapier. 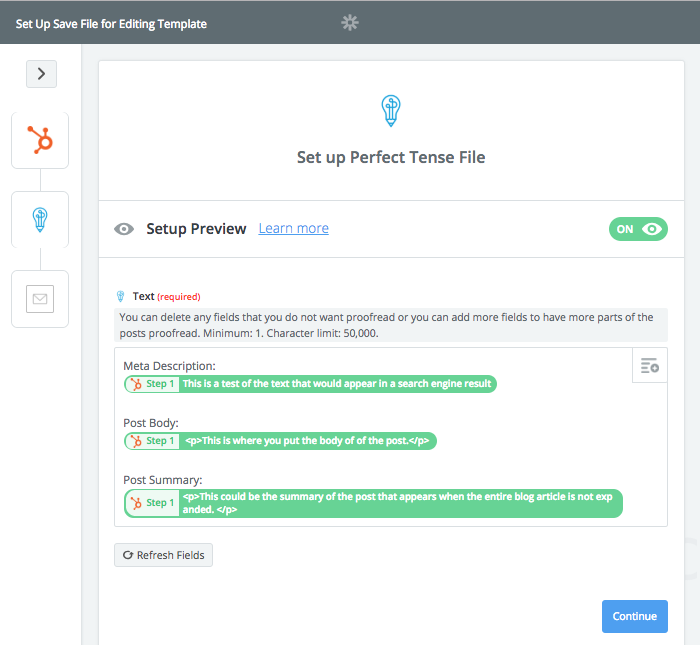 Once you have connected your Perfect Tense account, you will be able to choose which parts of your posts you want Perfect Tense to correct. The template defaults to having Perfect Tense correct the “Meta Description”, “Post Body”, and “Post Summary”. However, you can choose to delete or include as many types of content as you would like. 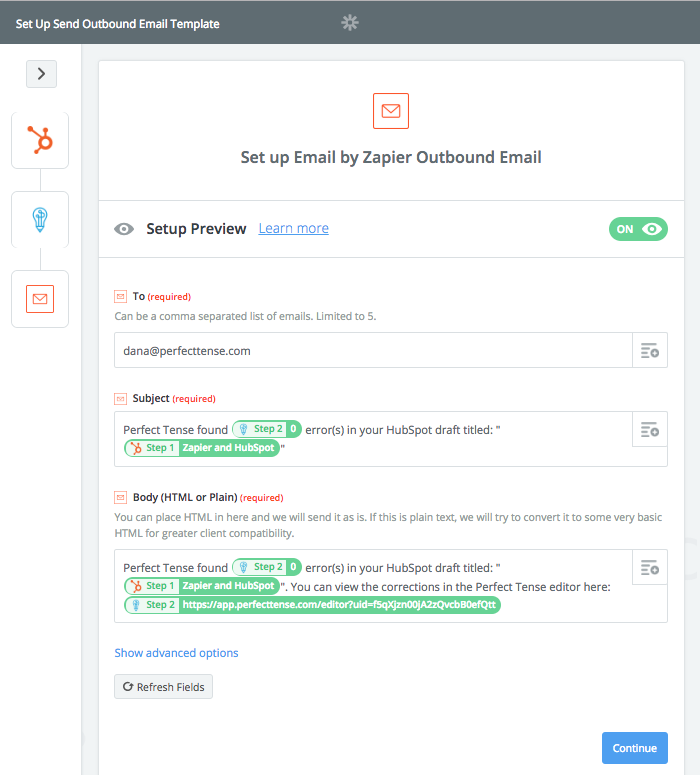 Clicking "Continue" will tell Zapier to send a sample correction to Perfect Tense. You are ready to set up the final step once this test is complete. Again, the action step will be pre-selected for you. All you need to do is enter the “To” email address you would like to use. The rest of the fields will be pre-filled out for you with information from the other steps. Once you have saved these settings, your integration is ready to go! It’s that easy to prevent spelling and grammar mistakes from making their way into your published posts!